In the future you may never need think to yourself you have nothing to wear as you will be able to print it out. The Electroloom 3D printer is a device that could soon spray you a new set of threads. 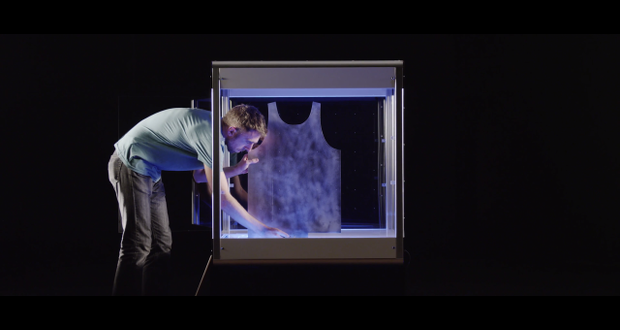 Electroloom is a little similar to the very conceptual PETE, from last year's Electrolux Design Lab, which turned PET bottles into clothing before your very eyes - something will.i.am would doubtless approve of. PETE seemed vaguely bonkers to us at the time, but what did we know, because this fashionable printer has been launched on Kickstarter now and appears to have a chance of becoming consumer reality. Built by computer engineer Joseph White and biomedical/mechanical engineers Marcus Foley and Aaron Rowley, the prototype printer sprays a liquid mixture of polyester and cotton as nanofibres, using an internal electric field to guide them to various clothing templates - T-shirts and pants, say - in a process called Field Guided Fabrication. The process should make a garment that requires no cutting or stitching. All you'll need to make clothes are some simple CAD skills. The device has been in development about 18 months and is still a work in progress. The team has now turned to Kickstarter to raise money by shipping a small number of alpha units and developer kits with enough printer liquid to make seven beanies, four vests, or three skirts (or a combination of the above, should you want a stylish skirt/vest/hat combo. Indeed, the Electroloom's Kickstarter page shows a perfectly functional vest, a skirt that looks like the wearer has a slghtly fraying sheet wrapped around her waist and a "beany" that's like some kind of Amish bonnet. “We are most excited to see what you come up with to design and create--wearable or not! Make curtains or doilies or scarves or lampshades. We can't wait to be surprised and impressed by what you're able to create with the Electroloom Alpha,” trill the developers, who are looking to raise $50,000 to continue refining the printer and processes. If that works out, the Electroloom is expected to ship in March 2016. The device will set makers back around £2,900.